Bill4Time is the professional way to track time, manage projects, organize expenses, invoice clients and accept payment for your business. Offline capabilities so you can track your time while on the go. 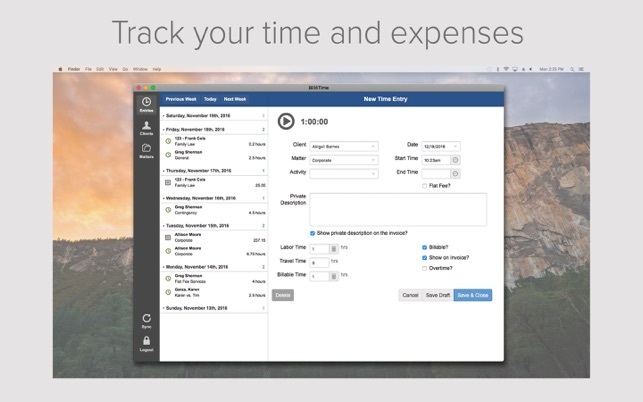 Bill4Time's companion desktop application for Mac is your complete time billing solution. Trusted by thousands of law firms, freelancers, small businesses, independent contractors, CPAs, universities and professionals from all over the world. • Free time billing and support. Plan includes 1 user, 3 clients, 5 projects and 100mb storage. 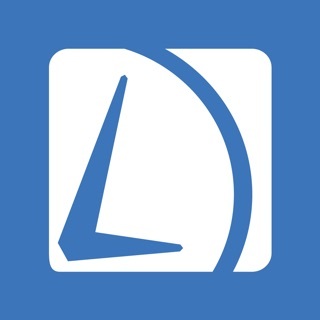 • Track time easily with our one-tap timer, you can even track your non-billable time! • Charge per project? Tap flat fee billing and enter your amount, that simple. • Access, add, and edit client or project details on the go. • Both time tracking and expense tracking features are organized by client and project. • If you are without a data connection your time and expense entries will save and sync when back online. • Assess your business with over two dozen specialized reports. • Accounting that integrates with QuickBooks. Minor fixes and performance optimizations. Looks advanced, but fails to live up to the visual. WARNING: The start/stop timers on this Mac OS X app (and the Chrome app) do NOT work reliably. Do not waste your money on a bill4time subscription. After nearly three years as a subscriber, I am cancelling my subscription because bill4time simply fails at fulfilling its core function—tracking my time. I have been telling bill4time about the problems with its start/stop timers since March 2015. Yes, that’s right, 2015! When I first alerted them to bugs in the Chrome app, the bill4time reps told me their developers couldn’t recreate the bugs I was seeing, and that, in any event, they were working on a Mac desktop app which should work fine. In the ensuing months, I alerted bill4time to more problems with the start/stop timers which were causing me to lose the billable time I had previously tracked. Their developers still couldn’t figure it out. I remained a bill4time user for so long because: 1) the user interface is admittedly quite nice for lawyers tracking time, 2) I wanted to be patient with a startup that was still working out the kinks, and 3) I didn’t want the hassle of switching platforms. When this Mac desktop app arrived, I was hoping the timers would finally be fully functional. Nope! They’re worse! I sent bill4time video recordings of my screen which show how their apps fail to capture my billable time. Even though the bill4time reps admit it’s a problem, their developers still don’t know how to fix it. In fact, they still can’t even figure out how to recreate the problem, which probably speaks volumes about their skill-level. I was quite loyal to bill4time for a long while, and even spent a lot of my time doing free quality control for them by sending them screenshots and screen recordings of the bugs in their apps. After all that, they wouldn’t give me a refund for my troubles—not even for one month. After some research, I discovered that there are better apps out there. Don’t waste your money on bill4time. You’d be better off just manually entering your time in a spreadsheet.